John Kerry, the first white male Secretary of State in 16 years, made some pretty corny jokes on his first day at work yesterday. "Here's the big question before the country and the world and the State Department after the last eight years: can a man actually run the State Department?" 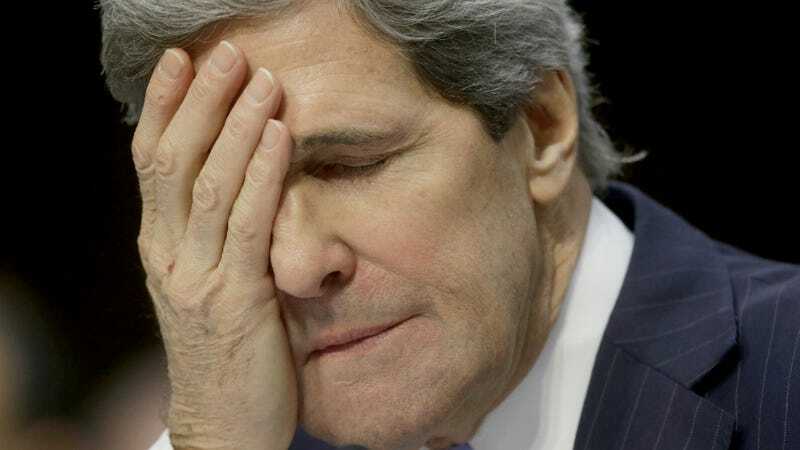 Kerry "asked" a crowd of Foreign Service Officers and staff at Foggy Bottom. "As the saying goes, ‘I have big heels to fill'." He then got super earnest as he waved his first diplomatic passport, given to him when he was a kid traveling to Berlin with his father and family who worked at the post-war U.S. embassy. He pledged that he would not let the patriotism and bravery of those who died in Benghazi "be obscured by politics" and promised to work super hard so that maybe we'll forget he's not Hillary Clinton. "What other job can you have where you get up every day and advance the cause of nation and also keep faith with the ideals of your country on which it is founded, and most critically meet our obligations to our fellow travelers on this planet?" he said. "That's as good as it gets, and I'm proud to be part of it with you. So now let's get to work." Then he made everyone pancakes with chocolate chips, because it was a special occasion.